We have for some time now advised our customers who have small children 42 months and under, to allow us to install safety controls to the blinds we are fitting for them. We have now also to advise on which type of blind is the safest to have with small children in the house. The industry regulations have now changed, and as suppliers & installers of made to measure blinds, have now to install the safety controls by law which is set out by the General Product Safety Regulations. Whilst the consumer is not bound by the regulations, we are, and as such the consumer cannot remove the Installer’s legal obligation under the GPSR. 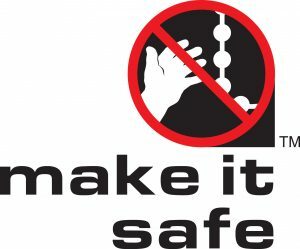 Safety Controls can be purchased for Rollers, Roman & Vertical Blinds for your existing blinds, (we do this for free when we supply & install blinds purchased from us) we do not recommend Venetian blinds with cords in a child’s room, however if you have existing Venetian blinds then we can advise on the possibility of replacing the blind or discuss how to make your blind safer.